Last week I broke my streak of drawing that stretched all the way back to early January. That’s over 100 days of not missing a day drawing. And then Friday, I didn’t draw. Saturday morning, I was back at Day 1. If this had happened 6 months ago, I would be spun out into a spiral of guilt, failure, and shame: How could I have been so lazy? 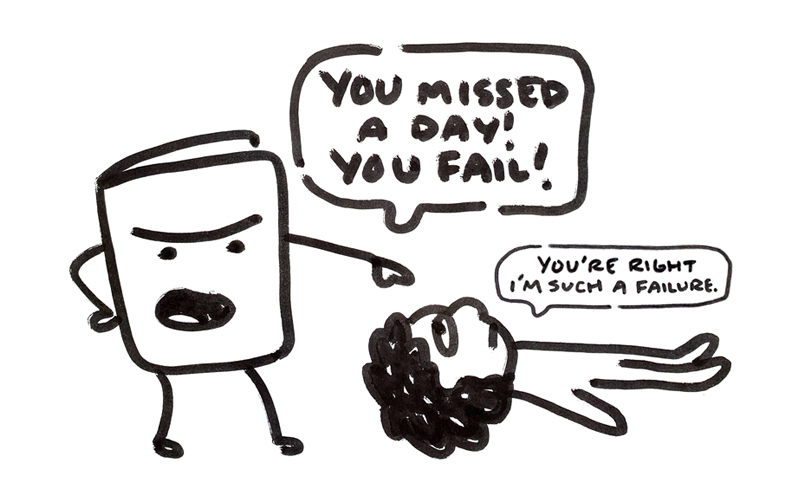 How could I have neglected to spend even just 5 minutes pumping out a teeny tiny drawing? How could I be such a terrible artist? My thought progression would quickly go from “I did something ‘bad'” to “I am ‘bad'”. I did not draw today = I am a failure. This is an unhealthy way to go about life, both as an artist and a human. And unfortunately, this is an extremely common way of thinking, especially for artists. But this mindset is severely detrimental to our mental health and our ability to keep making art. I didn’t draw that day last week because I spent the day driving around North Carolina to see family and celebrate my Grandma’s 86th birthday. It was a great day, but I was completely exhausted by the time I got home at midnight (Grandma parties hard y’all). As I crawled into bed, I remembered I hadn’t drawn yet that day. But I chose to relax, let go of perfection, and go to sleep instead of hashing out a drawing with my droopy eyes. 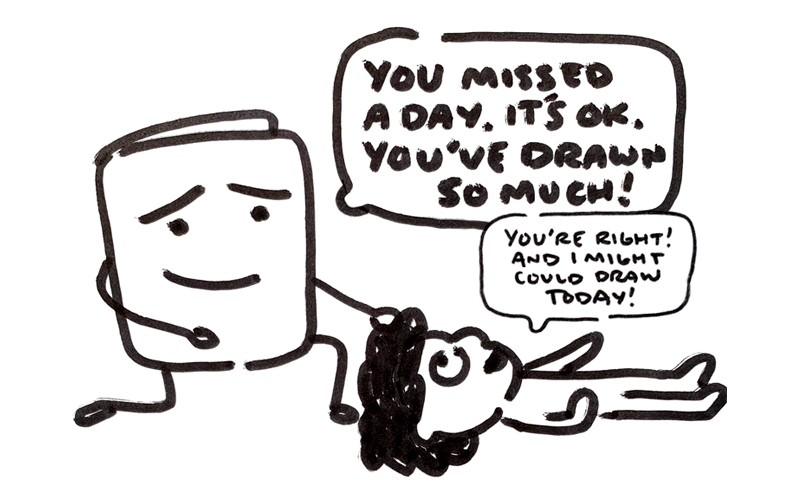 I often proclaim the benefits of drawing every day, but if you’ll notice, I usually say “almost” every day. I believe keeping up our sketchbook practice is one of the most important things we can do to grow as artists, but I don’t ever want that goal to turn into perfectionism or a die-hard obligation to complete that goal, and guilt and shame when I do not. Perfection is an unrealistic goal. Whether it’s your Grandma’s birthday, your child is sick with the flu, or you just have a ton of work to do, there will be days when you don’t draw. So what happens then? How does your goal help or harm you on the days you don’t quite make it? I make goals to encourage myself, not to trap myself. I have the goal of drawing every day not to rigidly force myself to draw every day, bar none, no matter what, but instead to give me the little nudge I need on sluggish days. 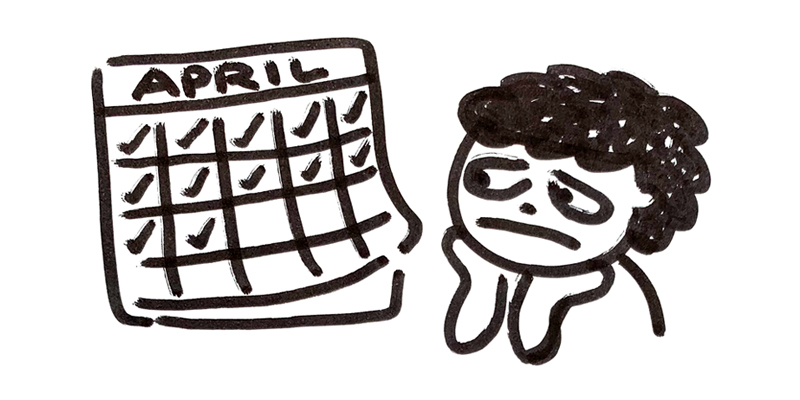 I have this goal not to help me draw a perfect streak of days forever and ever, but to help me draw a whole lot. This is about the big picture. Yes, I technically messed up my goal of drawing every day last week. But in the more than two years I’ve been practicing this goal, I have drawn far and away so much more than I’ve ever drawn in my entire life. I don’t draw every single day, but I draw a heck of a lot. And this Draw Every Day goal is the catalyst. That’s why my drawing challenge is called “Might Could Draw Today”, not just “Draw Today”. It’s not a command, a demand, or a rule that you draw every day. It’s a gentle suggestion, a compassionate challenge, a flexible encouragement, a reminder that maybe, just maybe, I might could draw today. And maybe not. Because some days there are other things in life that are more important than squeezing out another drawing, like your Grandma’s 86th birthday, your mental health, and your physical health. Because in the long run, we’ll be able to draw more if we allow ourselves to rest when we need it, prioritize our health, and treat ourselves (and our goals) compassionately. I started my business and named it Might Could Studios over 6 years ago. Back then everyone I spoke to advised me to use my name as my business name. But that just didn’t feel right. I stuck with my gut and named it Might Could Studios, without really knowing why. “Might could” is southern slang that my Grandma Josie and mom and I would have a habit of saying. People always thought it was weird and nonsensical but I’ve always liked it. I thought of it one day for the business and it just fit. It’s only now, after 6+ years of business and lots of drawing, writing, and therapy, that I’m beginning to understand what that phrase truly means to me. It’s evolved from just a piece of slang, to a business name, to a moniker, to a life mantra. I now view my life through the lens of the Might Could mantra. Can I paint with watercolor? I might could! Can I get a book deal? I might could! Can I heal my mental health? I might could! Can I draw every day? I might could! Some of the goals I approach this way are achieved (helloooo, book news coming soon! ), Some of the goals are attempted and then I realize they’re not right for me (helloooo, watercolor!) Some of goals I continually aspire to, and although I don’t fully complete them (helloooo, mental health and drawing every day! ), the Might Could mantra helps me approach these goals with compassion so I can get up when I fall down and try again, making more progress with every attempt. I am far from perfect at this way of living, and I still struggle with those negative thought patterns in my art and my life. But I’m trying to embrace this way of approaching my life with each day and each drawing. And because of this practice, I now have a new, more uplifting, more compassionate voice in my head to combat that harmful, inner critic voice. And the more I allow it to speak, the stronger it gets, just like my art. P.S. Comment below to share what compassionate goal you’d like to set for yourself,​ or how you can tweak a current goal to be more compassionate! I’d love to hear your ideas and thoughts!